I just finished reflecting on my year and updating my WRAP with new goals in mind. But I know that if I really want to get results in my life with my new WRAP, updating my plan isn’t enough. I have to actually use it. And I can’t use it if it’s just sitting in a drawer somewhere. That’s why my daily plan includes an important action item at the beginning and end of each day: checking (and adding to) my paper planner. I use a paper planner to keep track of my to-do list, work appointments and meetings, and important information about my kids’ and my husband’s schedules. I also use it for staying on top of goals I’ve set and projects I’m working on. One of the most important parts of my planner is a habit tracker. I use it to log whether I’m doing the things on my daily plan each day. One of the things WRAP teaches us is that when we notice early warning signs, we should make sure we’re doing everything on our daily plan. Here’s the truth, friends: When I’m seeing early warning signs, I’m also lying to myself about whether I’m doing the things I need to take care of myself—and I’m not paying attention to important details like how much sleep I’m getting or how much water I’m drinking. My habit tracker keeps me accountable for taking personal responsibility for my wellness. If I’m not checking off the habits in my daily plan every day, or if I start to see patterns like staying up way too late or skipping meals, that shows me what I need to do to start rebuilding my wellness. Having a habit tracker for my daily plan also helps me block out time in each day for the things that are really important to my wellness. These are things like exercising for at least 10 minutes, getting fresh air and outside light at least twice a day, spending connected time with my husband and kids, and checking in with a friend. When I look at my day in the morning and evening, I can see what’s coming up and what I need to do to have time for my own needs. My habit tracker is simple. Usually it’s just a sticky note with my habits written down the left side and the days of the week written across the top. I make a check mark under each day for the habit I’ve completed. If there’s space at the bottom, I’ll remind myself what’s included in things like “AM routine” or “PM routine,” which have multiple steps in them. If I have extra details I want to keep track of, like what time I go to bed, I’ll just write that in the space for that day in my planner. For me, it hasn’t been enough to just have a calendar or to-do list on my phone. I know this works well for some people, but it doesn’t for me. I can get easily distracted by notifications or other tasks on my devices. I also sometimes use my phone to escape or hide when I’m having uncomfortable feelings, so using it first thing in the morning or last thing at night doesn’t create wellness for me. That’s why I started using a paper planner a few years ago, and it’s been a very helpful tool for me. I keep it handy most of the time at work and at home, and I bring it in my purse when I leave the house. I just got my new paper planner for 2019 and I’m starting to set it up for the new year. I’ve blocked out days I’m off work, days my kids have no school, and other important dates. I’ve added a blank page in the back for my goals for the new year. 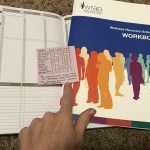 And I’ve inserted a copy of the daily plan page from my WRAP Workbook (page 5) to help me stay on top of my healthy daily habits. 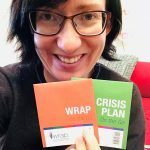 Before the new year starts, I’ll tuck a copy of my WRAP On the Go and my Crisis Plan On the Go in there also, so my whole plan is right where I need it every day, even if I’m out. How do you support yourself to follow your daily plan every day? Will you make any changes for the new year? I’d love to learn from your tips and ideas. Please leave a comment on our Facebook page.